It took twenty horses to pull RMS Titanic's 16-ton center anchor on the first leg of its journey to the shipyard, in Belfast, where Titanic was built. 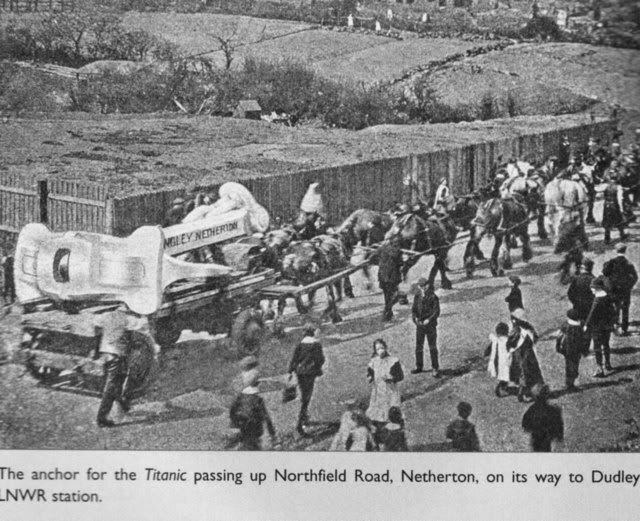 This photo depicts the anchor's route of travel as it made its way along Northfield Road (in Netherton, England). Titanic historian Jonathan Smith reports that this picture was taken by Edwin Beech and appeared on a 1911 postcard. It also appears in Chain and Anchor Making in the Black Country, a 2006 book by Ron Moss. When Frank Browne and thousands of other people left Southampton aboard Titanic, they were on the undisputed Queen of the luxury liner world. The second of three planned "sister ships," Titanic (at 882 feet) was the pride of J.P. Morgan’s White Star Line. Weighing 46,329 tons, the great ship drew 34 feet of water and was 92 feet wide. Built in Belfast, by Harland and Wolff, her engine room housed massive triple-expansion engines (capable of generating about 46,000 horsepower) geared to three enormous propellers. Her theoretical speed was 24 knots. Firemen, who shoveled about 650 tons of coal per day into the ship’s 159 furnaces, kept 29 boilers (each 3-stories high) working around the clock to produce steam which the ship needed while she was underway. Theirs was not an easy job. Sumptuously appointed, Titanic’s original plans called for 48 lifeboats. Those plans were reduced to 20, however, so as not to "clutter" the boat deck. Cork-filled canvas life jackets (3,560 of them) were made from a new design. According to a 1911 edition of Shipbuilder magazine, Titanic’s watertight doors (when closed) would make the ship "practically unsinkable." Even so, Titanic carried more lifeboats than regulations from the Board of Trade required for a vessel of her size. Who had designed this incredible floating palace? Alexander Carlisle and Thomas Andrews (who succeeded Carlisle in 1909) had also created a ship that could survive even if the first four compartments were flooded. Four was the operative number. More flooded compartments than four would put the ship at risk. The huge weight of water in five flooded compartments, for example, would pull the forward part of the ship down. If that happened, seawater would spill into each succeeding compartment, eventually causing the death of the ship. Such issues, however, did not concern passengers who boarded Titanic for her maiden voyage. They were much more concerned about personal accommodations. First-class passengers, whose expensive tickets guaranteed them more luxury than they could experience by rail travel, were treated to plush surroundings and exquisite service. Frank Browne’s photo of the gym shows state-of-the-art equipment for the time, while first-class passengers could retire to suites affording much more than privacy. Even second-class accommodations reflected quality craftsmanship and beautiful detail. Steerage passengers, who paid considerably less for their tickets, reached their functionally basic cabins by descending the main stairway to the third-class section of the ship. Locked gates would insure that steerage passengers (who could allegedly "carry diseases") would not reach the exclusive province of the wealthy. Bos, Carole "TITANIC - INSIDE AND OUT" AwesomeStories.com. Mar 01, 2004. Apr 23, 2019. Is It Wrong to Separate Passengers by Class, Then Lock-out the Lower-Class? How Do We Balance Competing Interests Like Safety versus Beauty?